Another mascara to add to my already overflowing stash? "Fat chance," thought this beauty chick as I picked up Elizabeth Arden Ceramide Lash Extending Treatment Mascara. There was just no way another mascara could work its way into the inner circle of Tarte, Lancome and Maybelline. But then I unscrewed the cap of the beautiful gold tube, and before I even swept the formula over my lashes I began to change my mind. The brush was full of thick, plump bristles that promised to make my lashes long, lush and full. And the fact that the mascara is infused with a mixture of Ceramide Triple Complex with Vitamins A, C and E (to reinforce and restore lashes' natural protective barrier) and Keravis (to strengthen and fortify lashes) just made it all the more exciting. A mascara that keeps my lashes healthy? Sign me up! As I swept the brush across my lashes, absolutely no smudging and clumping occurred -- which, in my opinion, is a complete miracle. Even my trusted standbys have a bit of that going on from time to time! 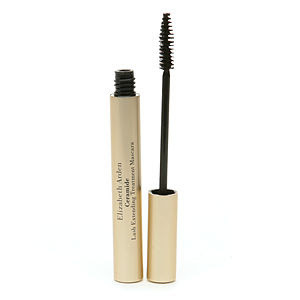 Elizabeth Arden Ceramide Lash Extending Treatment Mascara retails for $20 at beauty.com.